Did you know falls are the leading cause of injuries for adults 65 and older? For senior adults, falling can result in hip fractures, broken bones and head injuries. Falls can affect some older adults mentally too, causing them to become too fearful or depressed to stay active. • Loss of coordination, flexibility and balance. • Vision or hearing loss. • Medications that cause dizziness, dehydration or interactions with other meds. • Environmental factors, such as tripping hazards around the home. • Chronic conditions like diabetes, stroke or arthritis. 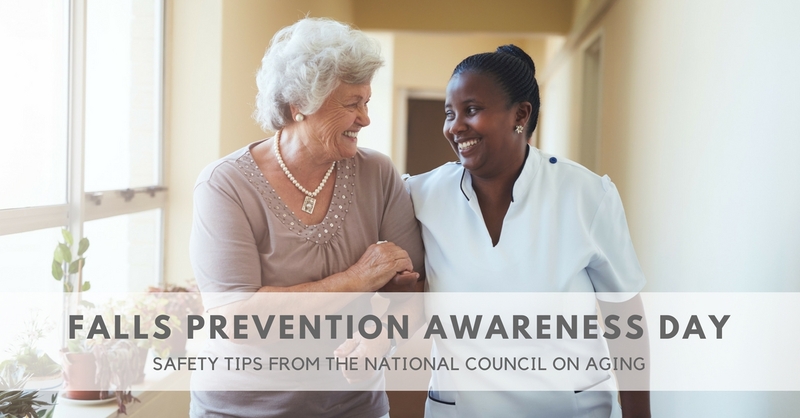 If you are a caregiver for a loved one, here are six simple steps from the National Council on Aging that you can take to help prevent falls, allowing your loved one to stay healthy as long as possible. Enlist their support in taking simple steps to stay safe. Ask your older loved ones if they’re concerned about falling. Many older adults recognize that falling is a risk, but they believe it won’t happen to them or they won’t get hurt — even if they’ve already fallen in the past. Encourage your loved one to discuss any concerns about falling, dizziness or balance with their health care provider. Assess their current health conditions. Is your loved one having trouble remembering to take their medications — or are they experiencing side effects? Is it getting more difficult for them to do things they could once do easily? Are changes in hearing and vision beginning to affect daily life? Talk about medications. If medications are causing side effects, talk to your loved one’s doctor or pharmacist. Medications should be reviewed each time they get a new prescription. Beware of non-prescription medications that contain sleep aids. These can lead to balance issues and dizziness. If your loved one is having trouble sleeping, encourage them to talk to their doctor or pharmacist about safer alternatives. Ask about their last eye checkup. Whether or not your loved one wears prescription lenses, older adults should have an annual eye exam to check for changes in vision or signs of other age-related vision problems, such as cataracts. If your loved one wears tint-changing lenses, remind them to use caution when going from bright sun into darkened buildings or homes. Bifocal lenses can also be problematic for some when using stairs. Encourage a conversation with your loved one’s eye doctor to make the most of their eyesight while keeping them safe. Consult a physical therapist. If you notice that your loved one is holding onto walls, furniture or someone else when walking or if they appear to have difficulty walking or arising from a chair, seek help from a physical therapist. A trained physical therapist can help your older loved one improve their balance, strength and gait through exercise. They might also suggest a cane or walker — and provide guidance on how to use these aids. Make sure to follow their advice. Poorly fit aids can increase the risk of falling. Do a walk-through safety inspection of their living environment. There are many simple and inexpensive ways to help make a home safer for aging adults, including: increased lighting throughout the house, secure rails on all stairs, and grab bars in bathrooms. Learn more about creating a safe environment for your loved one here. The National Council on Aging, U.S. Administration on Aging and U.S. Centers for Disaase Control also promote a variety of community-based programs, like A Matter of Balance, Stepping on and Tai Chi, that can help older adults learn how to reduce their risk of falling. Contact your Area Agency on Aging (AAA) to find out what’s available in your area. Find your local AAA by visiting www.eldercare.gov.